Home » »Unlabelled » One Mouthful of Delicious Sauerkraut = 1 Bottle of Probiotics!? Raw, fermented foods packed with health-promoting probiotics and have been staples of the human diet for centuries. Sauerkrauet is the probiotic king. It is is the superior source of LIVE probiotics and enzymes, and due to its pre-digested state brought on by the fermentation process, these nutrients are highly bioavailable to the body. This incredible discovery means that just 2 ounces of homemade sauerkraut has more probiotics than a whole bottle of 100 count probiotic capsules. One 16 oz jar of sauerkraut is equivalent to about 8 bottles probiotics! The numerous benefits of fermented foods are undeniable. They’ve been a staple of the human diet for centuries. Many people know sauerkraut as a traditional topping for a hot dog. But it is so much more than that. Did you know that in the 18th century, sailors ate sauerkraut on long voyages to prevent scurvy, a disease caused by vitamin C deficiency? Also, Chinese laborers building the Great Wall of China (more than 2000 years ago) ate shredded cabbage fermented in rice wine. Sauerkraut is made by pickling cabbage in a process called lacto-fermentation. (Real Food Fermentation: Preserving Whole Fresh Food with Live Cultures in Your Home Kitchen) It’s rich in enzymes that aid digestion and promote nutrient assimilation. If you consume sauerkraut, it will help to boost your body’s ability to digest foods properly and also aids in the absorption of nutrients. However, not all sauerkraut is equal. Most conventional store bought sauerkraut does not have the same benefits as homemade does. This is because it is heavily treated and pasteurized, thus destroying the fragile bacteria that sauerkraut is known for. 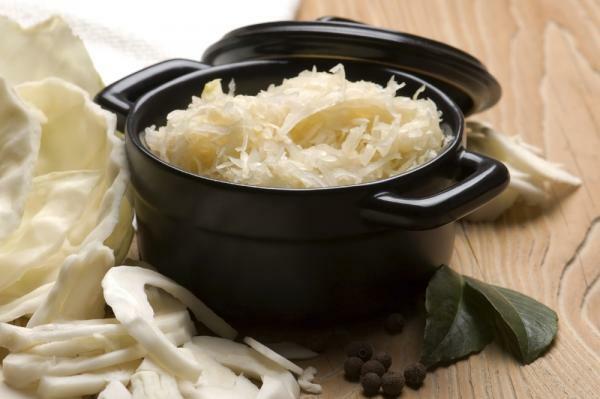 Making your own sauerkraut is a great way to make sure you are getting enough probiotics. In a bowl, mix cabbage with sea salt. Massage with your hands for about ten minutes. Juices will be released. Put the cabbage in a suitable fermentation container and pound down until juices come up and cover the cabbage, leave about 2 inches of space at the top. Cover the sauerkraut with a plate. Place a glass jug filled with water on the plate to press it down. Keep it at room temperature (covered with a towel). Fermentation will begin within a day, depending upon the room temperature. It will ferment best in a cool, dark place at a temperature that is consistently 64 to 70 degrees. Fermentation can take up to 3 weeks to a month. After fermenting, you can transfer it to the refrigerator.